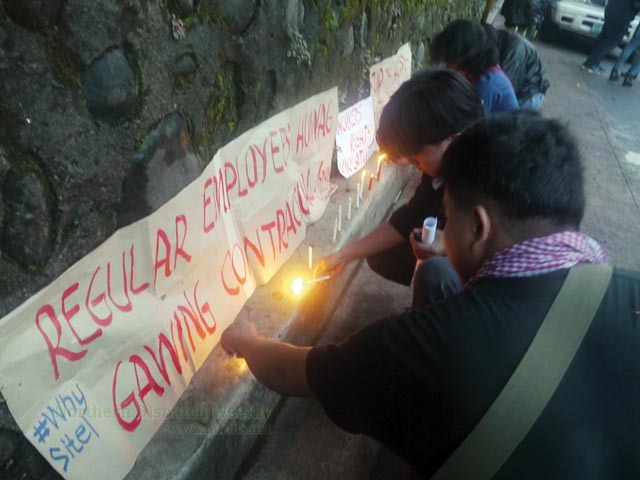 BAGUIO CITY — Protest broke at dawn on June 30 when members of the newly-formed Sitel Philippines Association of Rank and File Workers (Spark) picketed at the front gates of the Philippine Economic Zone Authority (PEZA) to denounce Sitel’s violation of labor rights. This after the group held a press conference to tell the public about the impending lay off of at least 1,000 Sitel employees last June 21. Vicente Toca III of Spark, said they were protesting Sitel’s massive lay-offs at the company’s Site 3. Sitel is a business process outsourcing (BPO) firm which has four locations in Baguio. Toca said Spark members were harassed and intimidated. He said that he himself was accused of coercing the employees to oppose the said employment scheme. “Kami ay humarap po sa diyalogo kasama ang mga biktima ng tanggalan na ito at sa ngayon lalong lumalawak ang tanggalan na nangyayari partikular sa mga regular na empleyado ng Sitel,” said Toca. Toca added that Spark tried to negotiate with Sitel management several times. The group faced harassment from management instead of negotiating with them for a reconciliation. “Nag-issue [ang Sitel] ng preventive suspension sa atin na tatagal po ng 12 days pero sa tingin po namin ito ay leading to termination na in the process. Sa issue ng Spark, from time to time ay pinapatawag nila kami. Nangyari ito [harassment] nung June 24 ng madaling araw,” Toca said. Sitel management forced Toca and other Spark members to reveal the names of the group’s members and the person who convinced them to talk to the media. He identified the Sitel officials behind the said harassment as Vice President for Operations Michael Dela Pena, Human Resource Manager Kristine Pineda, and the Senior Director for Partners and Communication Christine Matriano. Toca said that it is indicated in the company’s global media policy that Sitel employees are not allowed to talk to the media without permission.